You build with what you have, so it’s no surprise that people in cold regions like Russia and Northern China have been making things from ice for centuries. In the past few years, artists from both places have expanded on these traditions using science and technology to explore new directions in ice and snow art. Since at least the 1600s, people from China’s Heilongjian province have used buckets to freeze water, hollowed out the molded ice and inserted candles to make ice lanterns. The lanterns became more elaborate over the years, and in the 1960s, the provincial capital, Harbin, starting holding an ice lantern festival. The small, local event grew over the years into an amazing international extravaganza. To make such ambitious ice sculptures, artists and engineers have worked together to update the field’s technology. The Harbin sculptures are designed by local engineering students. Traditionally, workers have used huge blocks of river ice and carved with chainsaws, using chisels and heat to shape fine details. Now, they create extra-clear ice by deionizing the water. They use lasers to slice through the ice with much greater control than previously possible, and LED lights to change its color without dyes. In Russia, the most famous ice structure was the ice palace built for the Empress Anna Ivanovna in 1740. Twenty meters tall and fifty meters wide, the ice palace featured a bed made of giant blocks of ice. The empress decided to use the palace to hold the wedding of a disgraced aristocrat, Prince Mikhail Galitzin, whom Anna Ivanovna forced to marry an unattractive female jester, Avdotya Buzheninova. The couple survived their wedding night in the ice bed, reportedly by trading jewels for a guard’s sheepskin coat. If you’re wondering what any of this has to do with science or art, we’re getting to that. Russian born scientist and novelist Julia Sidorova was fascinated by the story of the ice palace, asking herself, “Was it a torture chamber or a scientific experiment?” Using this odd historical event as the starting point of her story, Sidorova wrote the 2013 novel The Age of Ice, taking as her main character one of the twins she imagined was born from that night on an icy bed. Her protagonist, Alexander Velitzyn, might be best described as a man with a core of ice. He is immune to cold, and also immortal. He becomes an artist of ice, although not an ice sculptor. It’s complicated. Sidorova, the author, is a biomedical scientist who works with human DNA at the University of Washington. She told Seattle Magazine, “Science is always embedded in my stories because it’s my world outlook.” She describes herself as “a complexity seeker” and that seems to hold true for both her scientific and literary styles. In the hands of artists like Sidorova and the sculptors of Harbin, frozen water can get very complex and sophisticated. As a material, ice comes almost prepackaged with metaphors: it’s hard, it’s cold, it cracks, it can be pure and clear or cloudy and dirty. And of course, in the end, ice melts. Even in frigid Harbin, with an annual average temperature of just 38 degrees Fahrenheit, the giant sculptures generally don’t last beyond the end of February. This hard truth adds yet another layer to ice as art – its ephemeral nature adds poignancy to its beauty. To paraphrase Robert Frost, nothing cold can stay. 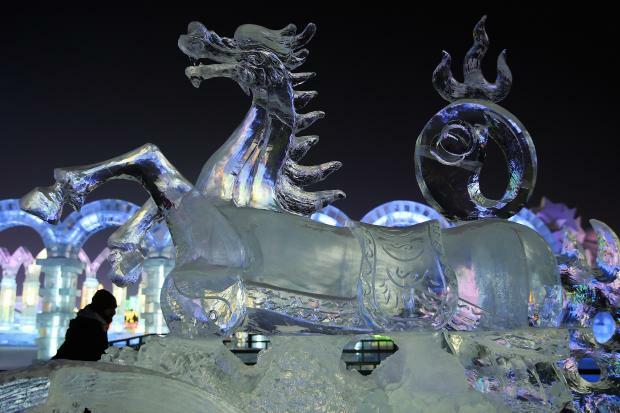 This entry was posted in The Art of Science and tagged Harbin Ice Festival, Ice Art, Ice Sculture, JM Sidorova, Julia Sidorova, The Age of Ice. Bookmark the permalink.